Agile Project Management meets team chat of the 21st century. Seamless team communication is key to building great products. Slack is designed with simplicity and ease of use in mind to make your team communication challenges a thing of the past. Whether your team is co-located or distributed around the world Slack has you covered. 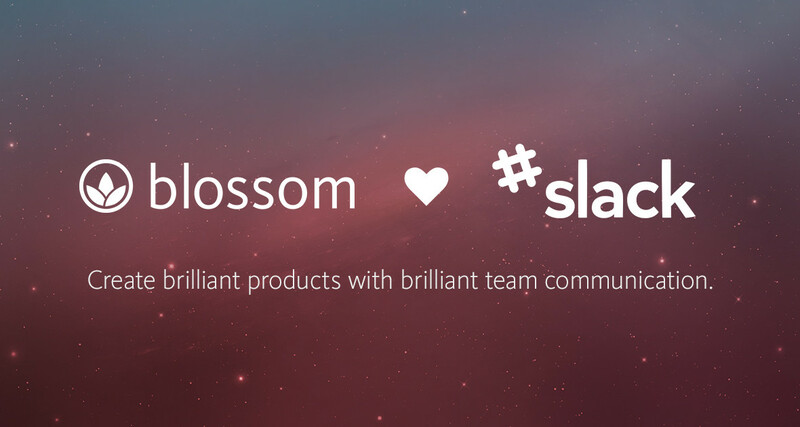 At Blossom we live and breathe these qualities as well so we weren’t surprised that a lot of our customers were already using Slack in their software development teams. That’s why we were super excited when we set out to design our integration for Slack. 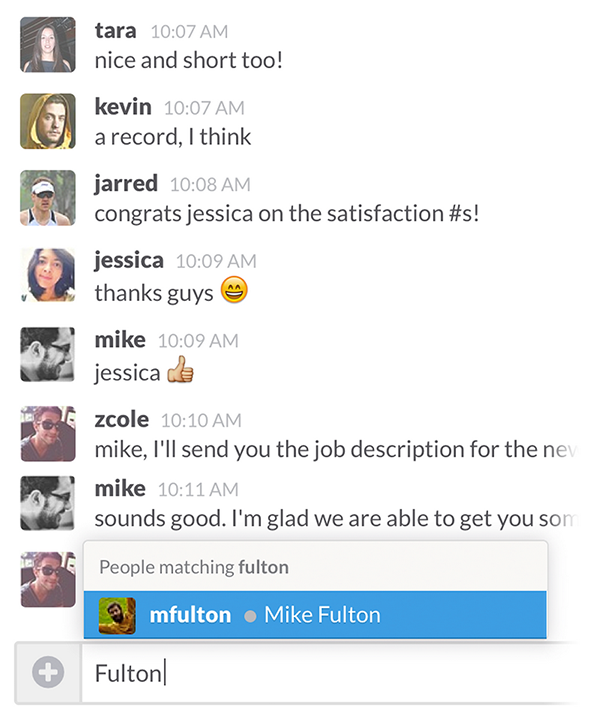 Slack is a simple yet powerful real-time group chat built for teams of the 21st century. First of all Slack is there for you wherever you are. It works great in situations when you are co-located as well as when you are distributed over many continents and time zones. Slack also comes with super powerful search functionality. Slack’s universal search helps you to find past discussions and decisions that were made because it understands the context of whole conversations, not only single messages. This feature is almost invisible but incredibly valuable when you really need to find that conversation from a few months back that you are looking for. On top of that Slack is indexing the files you share. This means that you can not only search through conversations but also deep into the files you were talking about. There are a lot of super useful little big details and easter eggs in Slack. For example you can use @mentions that allow you to notify a certain person or a group of people. If you are sending your fair share of colour hex codes around like we do you will love that Slack automatically displays a small coloured sample of it inline. Slack also has great support for emoji icons. 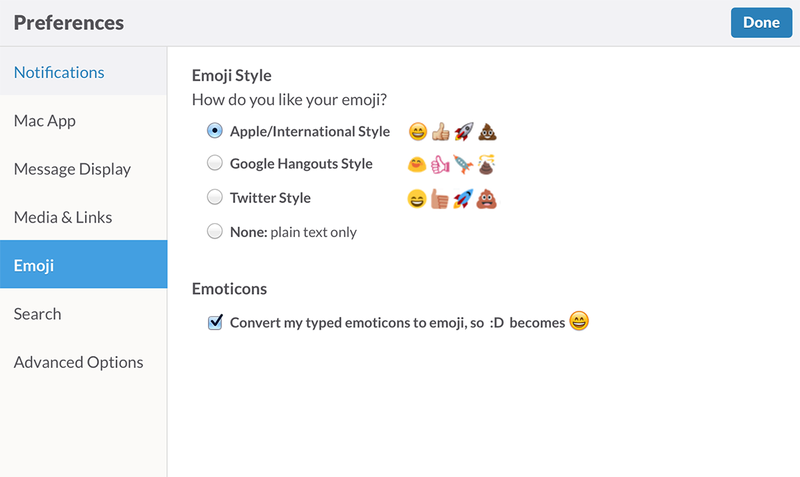 It even allows you to choose whether you prefer Apple, Google or Twitter style emojis. If you‘re a fan of good old plain text on the other hand Slack has you covered as well. Migrating to Slack is super seamless. You can simply import your previous conversations from tools like HipChat, Flowdock and Campfire. On top of that you get instant access to Slack’s powerful universal search as if you had used Slack from the beginning. These features alone make Slack a super valuable tool for any team. But where Slack really shines are its integrations with other products. How does Slack work with Blossom? Similar to our integrations with Atlassian’s HipChat and Rally’s Flowdock we send the most important activities from your Blossom projects over to Slack. Once connected we will send a message to your channel every time something interesting happens in your project. The usual notifications that will show up in your Slack channel are things like cards that got created, blocked or moved, screenshots you’ve uploaded as well as comments that you’ve posted. We’ve made a brief video that shows some examples how our integration works in the day to day. Setting everything up only takes a few seconds. Just head over to your Blossom project settings and select Slack. 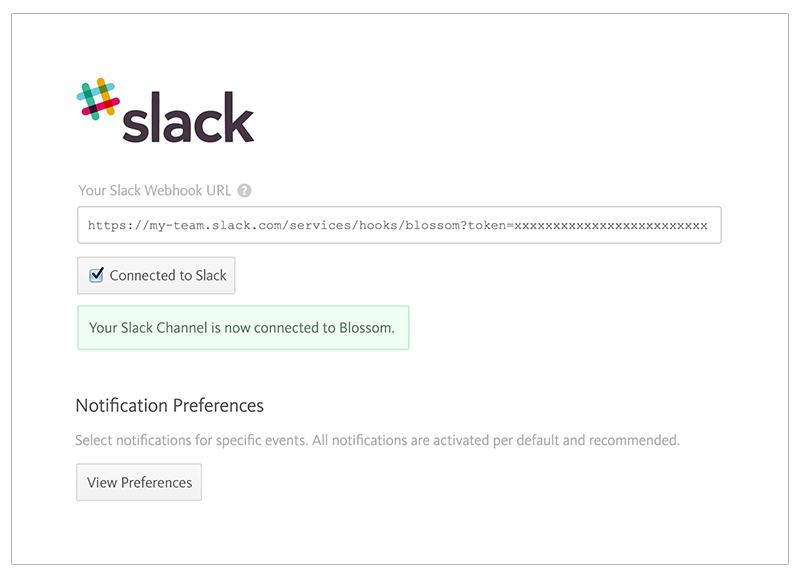 This will take you to the setup screen where you just need to fill in your Slack Webhook URL and click on the button to connect Blossom to your Slack channel. That’s pretty much it. Your Blossom project is now connected to Slack and you should have received a connection success message in your Slack channel. If you’d like to filter certain notifications from being sent to Slack, press the “View Preferences” button to make adjustments. To find your Slack Webhook URL go to your Slack Channel, click the down-arrow next to the channel name and click “Add a service integration …” from the popover. 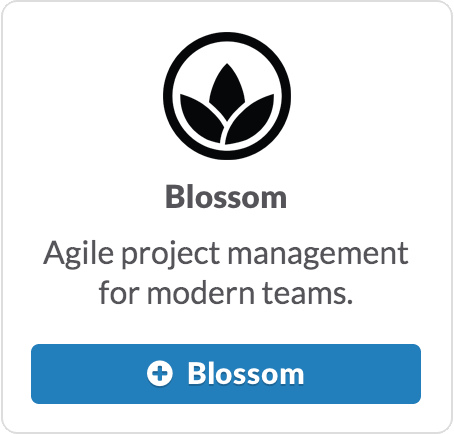 Now select Blossom from the Slack integrations page. 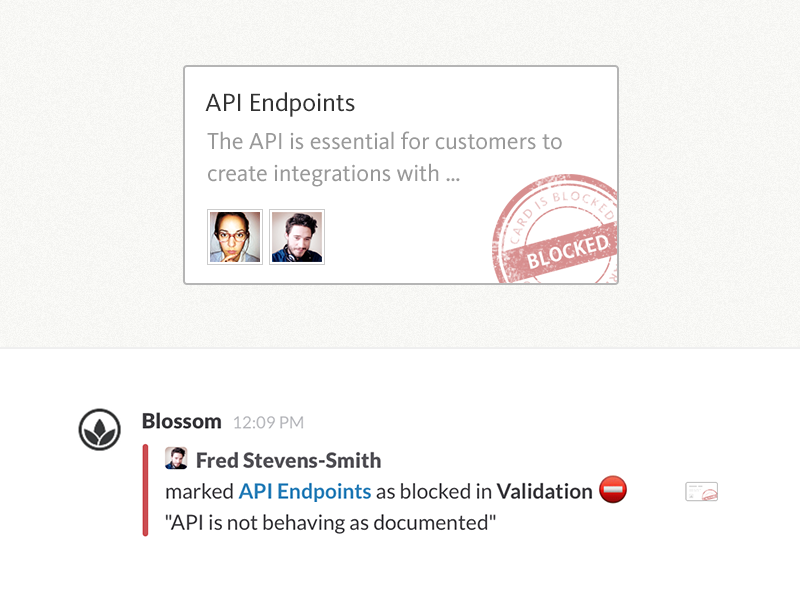 Now you only need to select the Slack Channel that you want Blossom to post notifications into. Once you’ve clicked the “Add Blossom Integration” button you will see a green “New integration added!” success message. On the same page, copy your Slack Webhook URL and paste it into the settings screen in your Blossom project. We are really happy to make this feature available for all our customers starting today. Thanks a lot to all of our trusted testers and the great folks over at Slack for making this possible. You are amazing. Connect one of your Blossom projects to Slack today and tell us what you think. If you want to give Blossom a try you came to the right place. Just sign up and get started with your free 14 day trial.